Kenneth Nyangani was arrested on Monday, after he wrote the story, entitled Grace Donates Used Underwear, which was published in the private newspaper, NewsDay. Businessman and Zanu-PF legislator Esau Mupfumi was quoted as having said the donation to party supporters had come from Mugabe. “Recently, I visited the State House and met First Lady Grace Mugabe. I was given these clothes to give to you,” Mupfumi was quoted as saying. 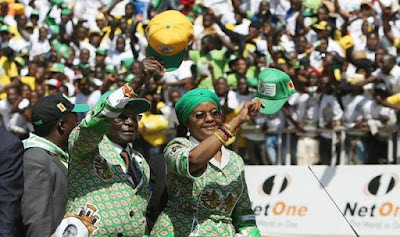 The “donation” raised eyebrows in light of reports that the First Lady and her son had recently imported luxury vehicles worth millions of dollars, while the majority of Zimbabweans struggle in poverty. Zimbabwe Independent reported on Friday claimed that Grace Mugabe bought herself a Rolls-Royce worth nearly $500 000 in South Africa. Last month, reports from Harare said the First Lady’s son, Russell Goreraza, imported two Rolls-Royce limousines. On Tuesday, Zimbabwe Lawyers for Human Rights (ZLHR) said it had deployed a lawyer to assist Nyangani. It was not immediately clear what charges Nyangani was facing. » Between Efe & Olajumoke; Whose Grass To Grace Story Inspired You More?